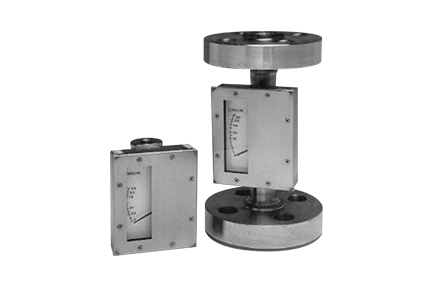 The 5000 series flow indicators are magnetically coupled, variable area orifice meters suitable for a wide range of liquids. No external power is required and they are heavily constructed for use in the process industry, making them suitable for local indication on high-pressure lines. Flow tube machined from solid bar material for high pressure integrity. Available with NPTF threads, flange or weld preparation process connections. No glands or seals to leak. Contact materials to D1N50049 31B / EN10204 3.1.B. Calibrated to suit specific applications. Working pressure in excess of 700 bar g.
Various sizes are available from ¼” to 2″. Instrument Accuracy ± 10% FF Repeatability ± 2%. Low Pressure drop due to small internal sizing. Design allows calibrated flow rates down to 50 ml/hr. Instrument accuracy is maintained regardless of system pressure changes. Each unit supplied with calibration, hydro-test and material certification if required. Can be fitted with optional Flameproof or IS Low Flow Alarm.